We are delighted to share our next Kundalini Yoga, Gong & Plant Based Retreat. This is our 3rd year of running these retreats and we are very grateful for what we create together. We are passionate about our students receiving a deep kundalini experience at an affordable price. Scotty Leigh-Janney (KYTA registered teacher) will be sharing his love through kundalini yoga throughout the weekend to inspire the mind, body and spirit. Arrival is from 4pm with a welcome meeting and short arrival meditation at 5pm before dinner at 6pm followed by an Evening Activity to help us ground and connect ready for the weekend. Saturday will be a full day (see typical day below) and Sunday will close at 4pm and departure by 5pm. Short yoga class before breakfast (known as Sadhana) followed by a warm healthy breakfast of porridge made with homemade almond milk served with blueberries, seeds & nuts along with herbal tea. A family style served lunch of a warm homemade soup followed by homemade falafel, hummus, avocado, salad and beetroot quinoa. After lunch we will go out in to nature for an afternoon of yoga including a guided mediation and tree yoga, continuing to connect to yourself as your root chakra goes deeper into the earth all the way up to your crown and beyond. Before dinner there will be a couple of hours free time to connect to yourself, the grounds and the rest of the group. Dinner will be a 2 course yummy plant based meal and yes we know you will be asking Rachel for a copy of the recipes already! Saturday Evening offers a Sacred Space followed with Gong Healing. A luxury private barn set in 70 acres of fields and trees near Ashbourne, Derbyshire. Set in the heart of the Peak District National Park. The land and nature around adds to the sense of peace and tranquillity. The Main House offers 5 Twin & Triple Bedrooms along with One Twin Balcony Bedroom over-looking the meditation & yoga room. All of the delicious food will be homemade and will offer a variety of vegan, vegetarian and raw foods. Specific dietary requirements will be accommodated. Rachel Leigh-Janney will be preparing all of the food as she is very passionate about eating a clean, healthy and conscious diet. Driving is just over an hour from Birmingham and about 3 hours from London. All your yoga classes, kriyas, mediations and workshops. Please note the Early Bird Price is available until 2 months prior to the event. To qualify for the Early Bird Price the full amount must be paid by Tuesday 5th February 2019. 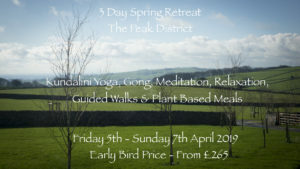 To book and confirm your place at our Kundalini Yoga & Plant Based Weekend Retreat a £50 deposit is required along with the completion of our booking form. Please note all payments are non refundable.